Microsoft can be considered a serious virtualization contender after the release of Windows Server 2012 R2 and Hyper-V. Now they consider initial hyper-converged deployments as two or three Hyper-V nodes with Clustered Storage Spaces configured on top of SAS JBOD. High implementation cost. The price of properly configured Clustered Storage Spaces configuration is approximately the same as a mid-range SAN or NAS appliance. Clustered Storage Spaces doesn’t support inexpensive SATA spindles and requires proprietary SAS-only hardware: JBODs, cables, HBAs, hard drives and Flash. The resulting implementation cost is significantly raised. Such a configuration also reveals performance issues due to the inability to use uber-fast PCIe Flash for cache or storage and PCIe-Ethernet cards for synchronization across the nodes. Traditional one JBOD installation can be considered a single point of failure, so it doesn’t make a lot of sense. Even connecting it through multiple SAS paths will leave non-redundant components, such as SAS expanders, Firmware, RAM, CPU, etc. All those components mentioned above are hidden inside the box, typically as the single ASIC, so no one really sees them. 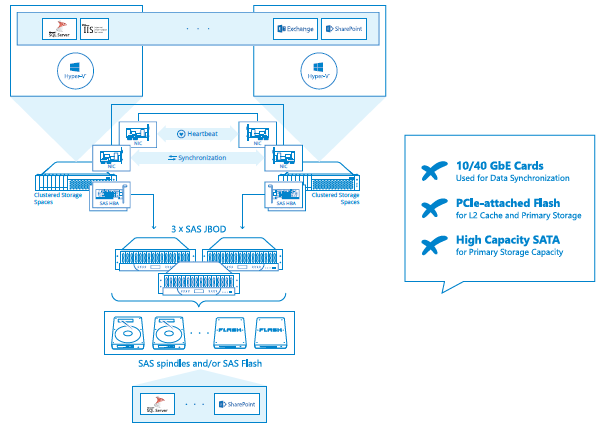 StarWind Virtual SAN gets rid of SAS JBODs and all-SAS hardware. It runs directly on the Windows Server 2012 R2 machines with Hyper-V role enabled. A significant CapEx and OpEx decrease is achieved by utilizing internal high-capacity SATA spindles and uber-fast PCIe Flash drives, which are basically “mirrored” over 10 and 40/56 Gbps Ethernet. There is no need for switches in basic two-nodes configuration since the nodes are connected directly with the cross-over cable, making TCO even lower. Log-Structuring File system (LSFS) eliminates I/O blender, which boosts the performance of VM-specific workload. 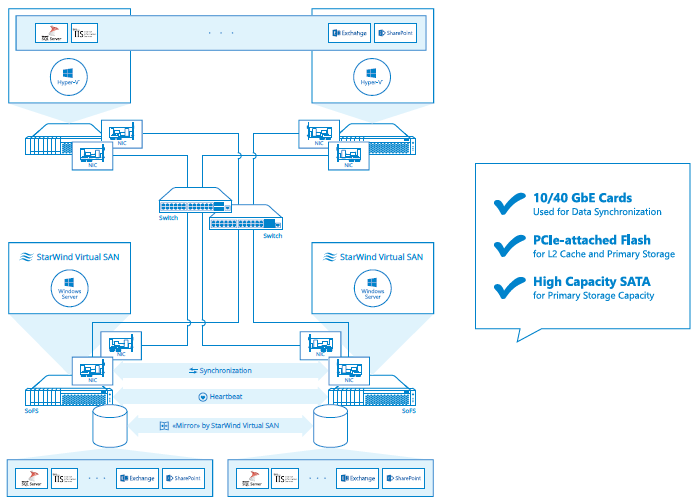 StarWind Virtual SAN makes Microsoft Hyper-V hyper-converged scenario affordable while boosting performance at the same time as the result of removing having the SAS-only based storage backend. As the result, it is possible to use cheap high-capacity SATA spindles, uber-fast PCIe-attached Flash and high-speed Ethernet NICs for inter-node communication, thus significantly dropping down the CapEx and OpEx of the entire storage system while making it more highly performable.